In deep concern for the health and well-being of poet and artist Liu Xia, Norwegian PEN calls for all restrictions upon her to be lifted immediately and unconditionally if, as it is feared, she remains under unofficial house arrest. We in Norwegian PEN are, together with PEN members all over the world, lamenting the death of writer and Nobel Laureate Liu Xiabo. Following his death, we hoped to see that the restrictions placed on his wife Liu Xia would be lifted. As far as we know, this has not happened. We have reports saying that attempts to contact her have been prevented by the Chinese authorities, despite assertions that she is free. Since Liu Xia was placed under unofficial house arrest without charge or legal due process, we allow ourselves to point out that as a signatory to the International Covenant on Civil and Political Rights, Chinese authorities are obliged to “refrain from acts that would defeat or undermine the treaty’s objective and purpose”. The treaty provides for freedom of legitimate expression, the right not to be arbitrarily detained and the right to a fair trial. We hope that Liu Xia will be granted her rights and will get a fair chance to take up a normal life after all she has been going through. 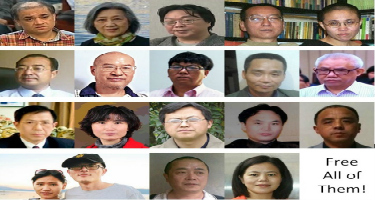 In China writers, journalists, the Independent Chinese PEN Center and its members, as well as other critical voices have been persecuted, harassed, imprisoned, and sometimes forcibly disappeared. Norwegian PEN and the Writers in Prison Committee call on Chinese authorities to comply with the right of freedom of expression. The Norwegian PEN and its Writers in Prison Committee is hereby calling for the release of all writers, journalists and publishers imprisoned in violation of their right to freedom of expression in the People’s Republic of China. We are urging you to cease the harassment and persecution of members of the Independent Chinese PEN Centre, and lift all restrictions on their freedom to exit and enter mainland China, particularly to attend PEN International conferences and to return home. We are also calling on you to end the practice of enforced disappearance and the use of forced confessions, which contravene an individual’s right to fair trial. Finally, we are calling on you to ratify the International Covenant on Civil and Political Rights, which was signed by the People’s Republic of China in October 1998.